Split (/ˈsplɪt/, as the English word split; Croatian pronunciation: [splît] ( listen); see other names) is the second-largest city of Croatia and the largest city of the region of Dalmatia, with about 200,000 people living in its urban area. It lies on the eastern shore of the Adriatic Sea and is spread over a central peninsula and its surroundings. An intraregional transport hub and popular tourist destination, the city is linked to the Adriatic islands and the Apennine peninsula. In 925 Tomislav's Kingdom of Croatia emerged in the hinterland of the city, centered in Nin as an ally of Byzantium against Simeon I of Bulgaria - though without receiving any power from the Emperor over the Dalmatian cities. The rise of the rival Bishopric of Nin, headed by Bishop Gregory, which attempted to institute the "Slavonic" or "Slavic language" as the language of religious service, led to the 925 Synod of Split, at which it was decreed that "no one should presume to celebrate the divine mysteries in the Slavonic language, but only in Latin and Greek, and that no one of that tongue should be advanced to the holy orders". 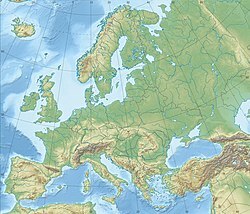 ^ a b c d e f g h i j k l m n o p "Gradovi prijatelji Splita" [Split Twin Towns]. 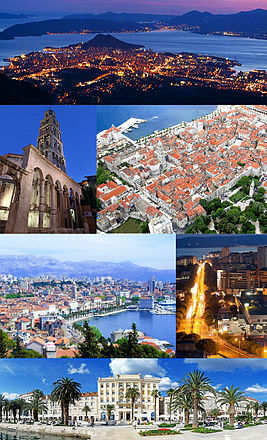 Grad Split [Split Official City Website] (in Croatian). Archived from the original on 24 March 2012. Retrieved 19 December 2013.